The more things we find to celebrate, the better a party can be. Hence we decided to bring two outstanding milestones together: the launch of the newest ZTE cell and the million people subscribed to the Mexican vlogger Jiot’s Youtube channel. The campaign was held up on two stages. First, a teaser phase in which anyone willing to attend the party just needed to share a greeting for Jiots and follow ZTE’s social channels to earn a pass, that could also be obtained through different contests ran by supporting media. Secondly, the party itself with a very special coverage, carried out by 8 influential ambassadors, during which different items were gave away to the audience interacting from social networks. 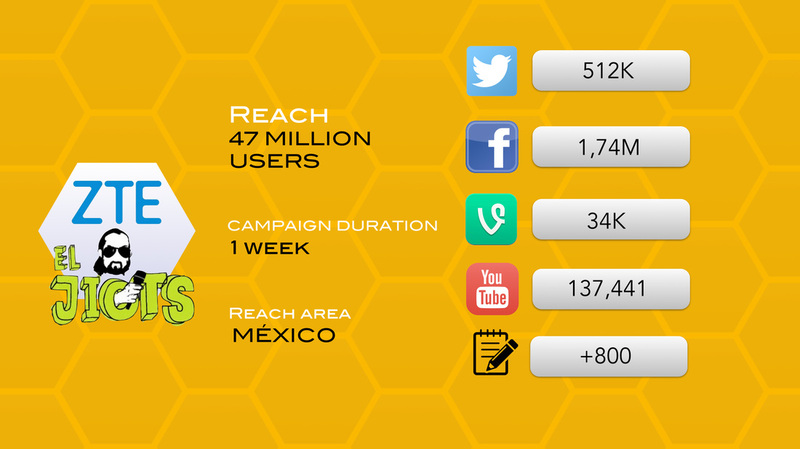 One of the hashtags reached the Trending Topic status and brought the pictures all over Mexico. The host enjoyed a warm celebration for his success in Youtube, and likewise the brand managed to spread the word about its last novelty amongst a 100% product-related target. The great achievement: to generate more than 2 million video views in one week, eventually exceeding the initial expectations.